Want a Free Copy of our Magazine? Home | Tips & Ideas | Want a Free Copy of our Magazine? We produce a glossy printed magazine with over a hundred pages to showcase our amazing work. It features professional photos highlighting the different type of projects that we have completed. There are also testimonials from our great clients, stories about our business, and content about our best work of the season. 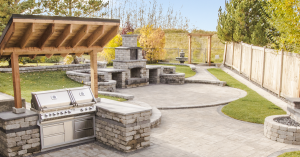 Our magazine is a great tool for planning your next landscaping project. Get over 100 pages of beautiful landscape ideas delivered to your door! Sign up for our e-newsletter and receive a FREE copy of our latest Magazine. Find inspiration for your next project! Why Take Down your Lights? Contact us today to find out more about our services and what we offer.